In the heart of the Eifel, with its fantastic landscape, at an altitude of 470 meters, lies the "Sources City Gerolstein". This holiday accommodation is situated in a pine forest, right in the midst of the wilderness. It is a spacious holiday bungalow with a comfortable design, in a hospitable environment. The bungalow is situated around a central building which has a number of entertainment faciliities, and invites you for an unforgettable holiday! The Eifel Volcano and its surroundings offer a wonderful varied landscape where you can find vast forests, picturesque villages, deep crater lakes and narrow river valleys. In the main building of the complex you will find a restaurant, which has a magnificent view of the Eifel landscape, a small indoor pool, a sauna and solarium. At the site there are many recreational facilities such as tennis courts, volleyball/basketball court, an entertainment area, a children's playground, bar / cafeteria, large chess & checkerboards and a mini-petting zoo. In both summer and winter you can enjoy a ski-lift area in the vicinity (15km). The Type B4 is a unique detached chalet offering beautiful views of the valley. It can accommodate 4 persons and has an area of about 55 m2. This wooden chalet consists of a cozy living room with dining and sitting area complete with color television. Via doors from the living room you can access the terrace which is equipped with garden furniture. The kitchen is fully-equipped with a coffeemaker, refrigerator, crockery, etc - nothing has been left out. One bedroom is furnished with a double bed while the other has 2 single beds. The bathroom is equipped with a shower and toilet. 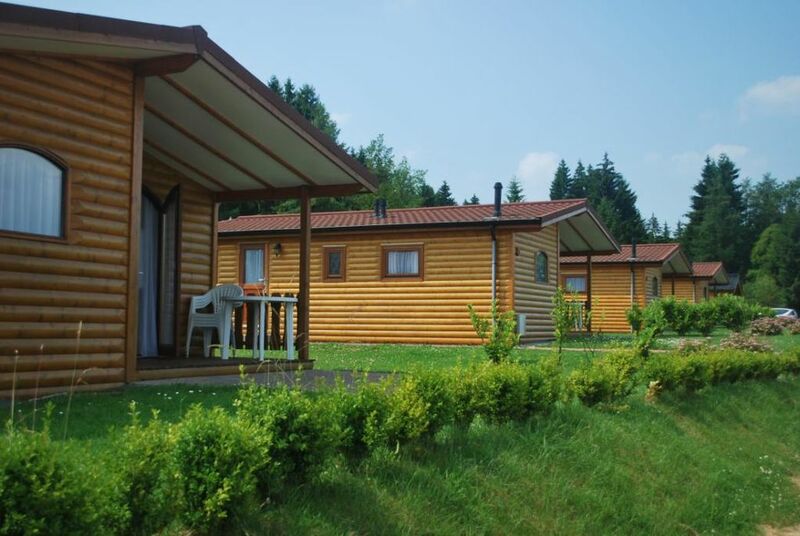 In short, a cozy accommodation in a wooded park, complete with magnificent views! The deposit of 50,00Euros has to be paid cash on spot at arrival. The old town of Gerolstein is nestled on a beautiful wooded hillside on the banks of the Kyll. Gerolstein is known for its carbonated springs and the Gerolsteiner Sprudel. For both young and old there are a variety of nice trips you can take from here. Depending on your interests you can visit the baptismal font at the Losheim Museum on the German-Belgian border, or Germany's oldest city (Trier) or even Luxembourg. The Eifel Zoo in L���nebach is a wonderful zoo set in the midst of a beautiful landscape. In addition to the many animals such as bears, tigers, lions, etc., you can also find tropical trees and plants. For the hiking and cycling enthusiasts, you will find a broad network of routes by the Volcanic Eifel. In the region of pelm, between the old walls of the castle square of the Stauffenburg, which dates from the 12th century, you can visit the Adler and Wolf Park of Kasselburg. Here there are soaring eagles, circling vultures, hawks, falcons, owls in large aviaries and a crying wolf! In the Wolfsschlucht (wolf ravine) in the forests around the Kasselburg live the largest wolf pack in Western Europe. In short, this makes a great starting point for your holiday discovery tour of the Eifel. Fishing is also possible in the region. In Stausee you can fish for trout, but Kyll's fast running waters also contain a nice amount of fish. In order to fish in Germany a German fishing license is required. This can be picked up in Gerolstein at the City Hall pick. To fish in the Stausee a day pass is needed (€ 10.00 per day).